Kamari (Καμάρι) is a seaside resort and port of the southwest coast of the island of Kos . It is a resort that has seen very strong growth in tourism low-end all-inclusive, barely higher than Kardamena , but with more families and seniors, many restaurants and shops. Kamari is the port of the small town of Kefalos , perched on a cliff above the station. 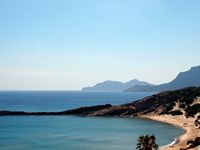 On the main road, Antimahia and Kos airport, continue towards the southwest to the immense gulf Kefalos. Just before Kefalos a road on the left leads to Kamari. The Gulf of Kefalos (Κόλπος Κεφάλου) is a semi-submerged volcanic crater located in the southwest of the island of Kos, the Gulf is closed to the west by the peninsula Kefalos dominated by Mount Latra (OROS Latra ) which rises to 426 m.
The Gulf is bordered by a long strip of sand 12 km in length, interrupted only by a few rocky promontories, including that of Agios Stefanos , where stands the ruins of an ancient Byzantine basilica. To the west of Agios Stefanos, 5 km of beaches extend from the port of Kamari, on the east of Agios Stefanos is still 7 km from beautiful sandy beaches, warm waters and a southern exposure, but wearing fanciful English names: Camel Beach, Paradise Beach, Banana Beach (Lagada), Sunny Beach, Magic Beach (Polemi) and Exotic Beach (Xerokambos) on the Gold Coast (Chrisi Akti). As one moves east, the beaches are less frequented, however the best are probably closest to Kamari Beach and Paradise Beach Camel.Sunny, Exotic Magic and are quieter. Each of these beaches is accessible through the wooded hills, in ways that are signposted from the main road of the island, lined with restaurants and shops for tourists. 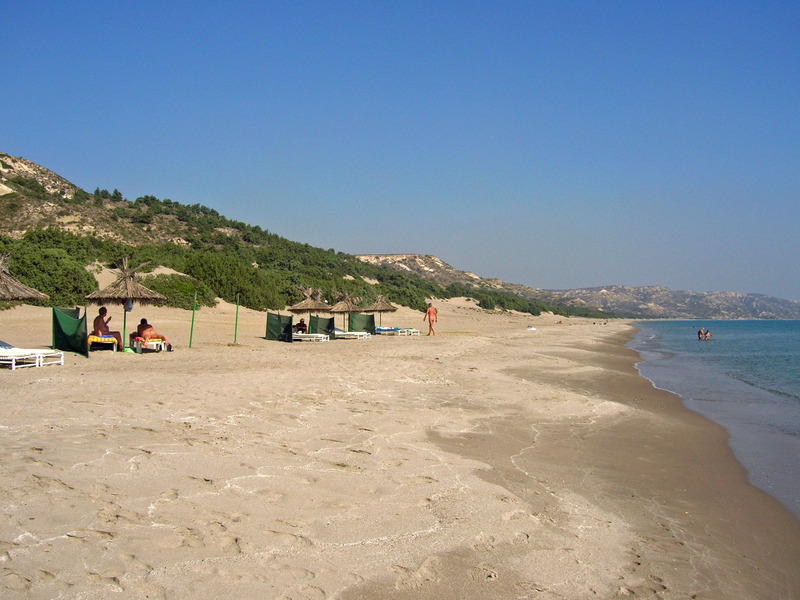 Kamari beach stretches over 3 km on both sides of the village. This is the beach of Kamari undemanding customers and is overrun with bars, cheap restaurants. 2 km before reaching Kefalos a road down to the basilicas ruins of Agios Stefanos and to Club Med. To the right of the headland which bears the ruins, is the small beach of Agios Stefanos. The island is a dyke Kastri volcanic remnant of the volcanic vent of the crater that forms the Gulf of Kefalos. On the island there is a small chapel dedicated to Saint Nicolas (Agios Nikolaos), the patron saint of sailors, the island is also named St. Nicholas Island. The chapel is usually closed. The island Kastri is a short distance from the beach of Agios Stefanos (approximately 90 m from the shore) and it is possible to get there by swimming from the beach, wading sometimes in shallow water and taking care to surfboards and boats of the local school water skiing or jet skiing. 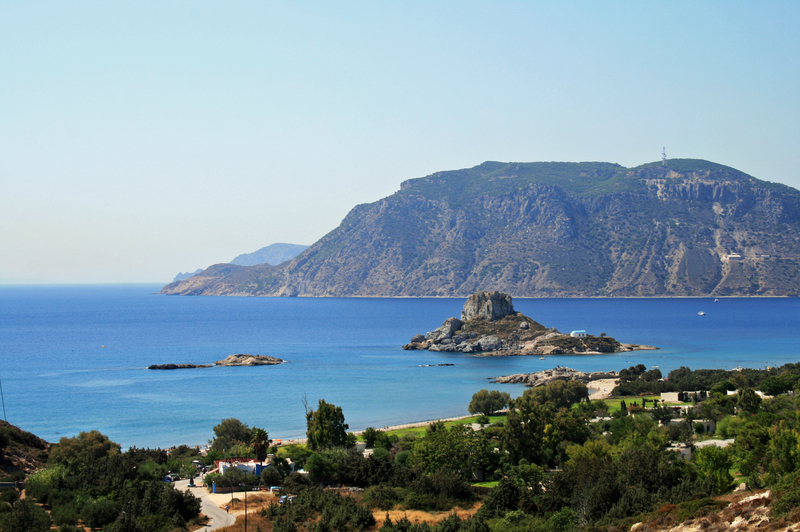 Kastri is one of the best sites of the island of Kos for snorkeling around the rock formations. The enormous complex of Club Méditerranée to the east of the basilica of Agios Stefanos. 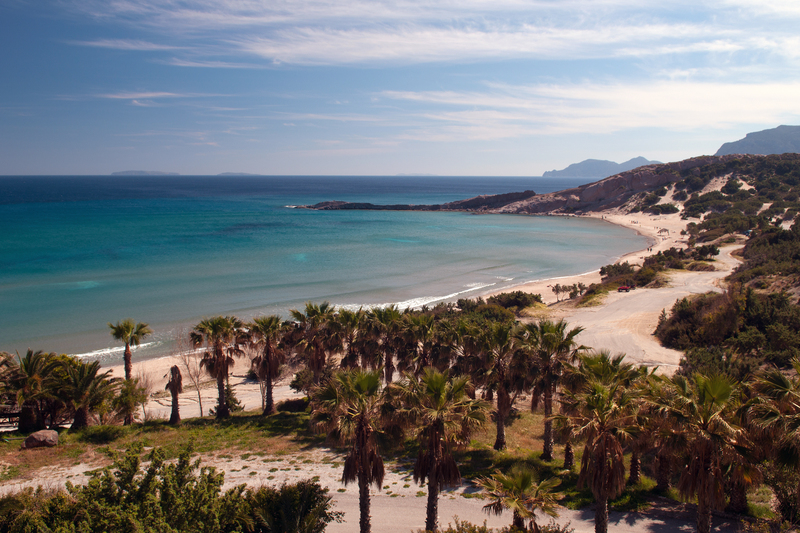 Club Med Kos has been closed since 2009 - officially for renovation - and he was even in 2012. 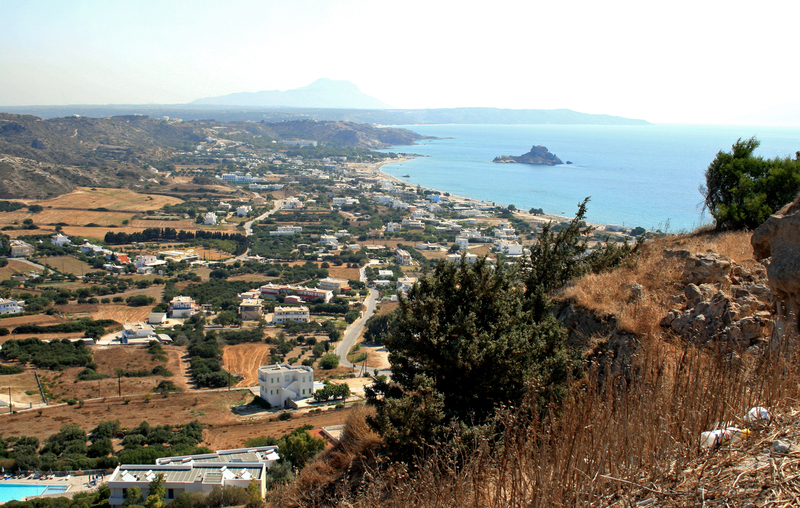 The site offers a beautiful view of the island Kastri . Range Kamila (Camel Beach) is located 6 km before reaching Kefalos . This beach is the shortest but the most picturesque, surrounded by rocks and sand, it is also less crowded and quieter because access is more difficult, by the way, in fairly steep, unpaved . There is a tavern, but no noisy jet skis. Paradissos officially named, Paradise Beach is perhaps the most beautiful beach on the island of Kos, and also the most popular. It is also called Bubble Beach because of the volcanic gas escaping from the bottom at one end of the beach, and forms bubbles in the crystal. Most water sports are practiced. Paradise Beach is easily accessible by paved road from the main road. As the beach is quite small, it is often crowded and it is difficult to make their way to the sea through the chairs. The beach village Lagada is commonly called Banana Beach. 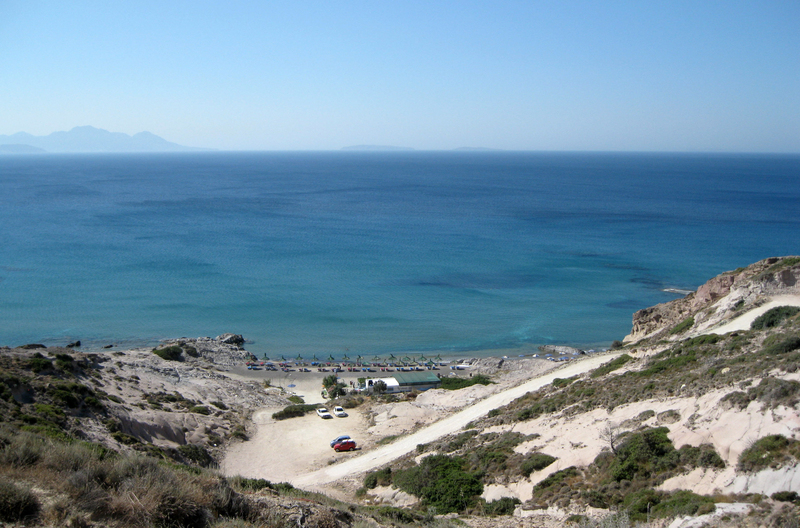 Lagada beach is one of the cleanest beaches and picturesque Gulf of Kefalos, with dunes covered with junipers. The beach of Sunny Beach is quiet enough. It is within walking distance of Magic Beach. 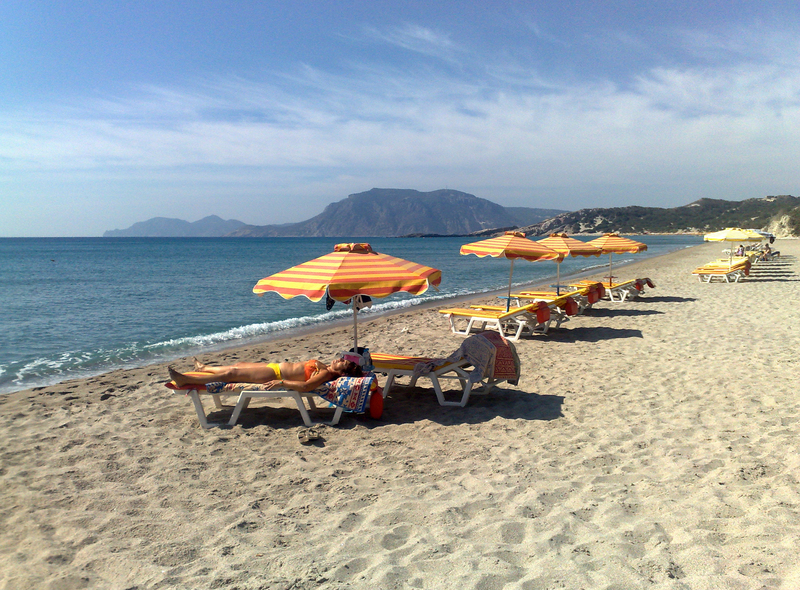 Polemi beach is the longest, widest and wildest beaches of the Gulf of Kefalos. It is also called Magic Beach. A tavern is located above the beach and the parking lot. 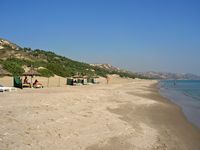 Range Xerokambos (Ξερόκαμπος) is an extension to the east of Magic Beach; Exotic Beach is the beach less equipped, nudists are tolerated. Excursion boats leave from Kamari to Nisyros (€ 16) two or three times a week. There are also boats daily to Paradise Beach , starting at 10 h and 30 h 30 to 17 back in the summer. 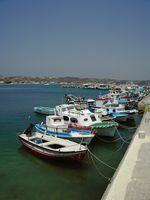 In Kamari is a marina that offers its services for many yachts and small boats during the summer.